Prone on the ground, I was at a disadvantage. I twisted and rolled, avoiding the staff’s blows. Ward spells weren’t my particular specialty, and I was growing weak on magic. I preferred to destroy enemies before they got close enough to swing at me. A thought occurred to me that I would need to strike back in order to escape. I couldn’t do it. I knew that this vision wasn’t really my brother, but I couldn’t bear the thought of raising my hands against him. The vision read my thoughts. It smiled ghoulishly. If you die in your nightmares, can you really die? Dodging blow after vicious blow, I managed to crawl into the pillars where the stone dragon of Akatosh stood. My ‘brother’ halted his advances. It didn’t want to come too close. It spat at me and glared at the stone dragon. The cloak of my brother transformed into Vaermina. I awoke as though I had been shoved from sleep. My hair was matted with sweat, like I was sick with fever. There was a bruise on my arm where I was grabbed. I touched it. It was cold. I clutched the amulet of Akatosh I wore on my neck. I looked out the window in the room. It was just before sunrise. “Are you ok, my Thane?” she said sleepily. I didn’t answer. My hands were shaking. “The nightmares are back,” she said, understanding my silence. “Yes,” my voice was unsteady. “I would not put much into it. She thrives on threats and torment in the dream world, but she does not have the power in Nirn to harm him,” she said, trying to comfort me. There was something else that I did not tell Lydia. 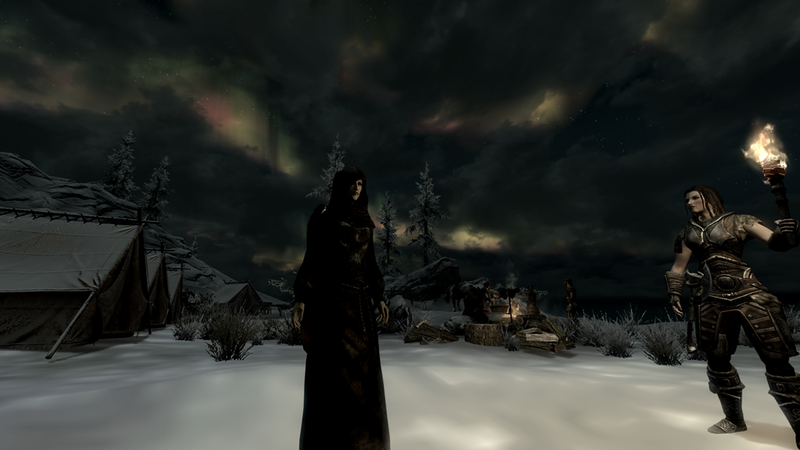 It was the vision of Alinius in Thalmor robes that perhaps disturbed me the most. It was possibly my greatest fear. Now that he and I were separate, I wondered if he was changing. Was he becoming more like them? I have seen what the Thalmor outside of Alinor are really like. The thought of my good hearted and noble brother becoming cruel and sadistic pained me. We pretended were were Knight of the Nine on crusade when we were little. The Thalmor were diametric opposites of the Knights. Would he hold true to the values we shared? I feared that was what Vaermina meant by taking what was important to me. It was true she only had power in the dream world, but dreams are access to the subconscious. She could implant ideas, as well as nightmares. “Yes, my Thane.” She left the room and headed towards the lobby. I headed for the washbasin. As I washed my face, I suddenly burst into sobs. After a minute, I composed myself. I washed my hair and tied it back into braids. I dressed in the hooded robes to conceal my tear reddened eyes. I met with Lydia downstairs, who offered me a sweetroll for breakfast. I declined and said I was not hungry. 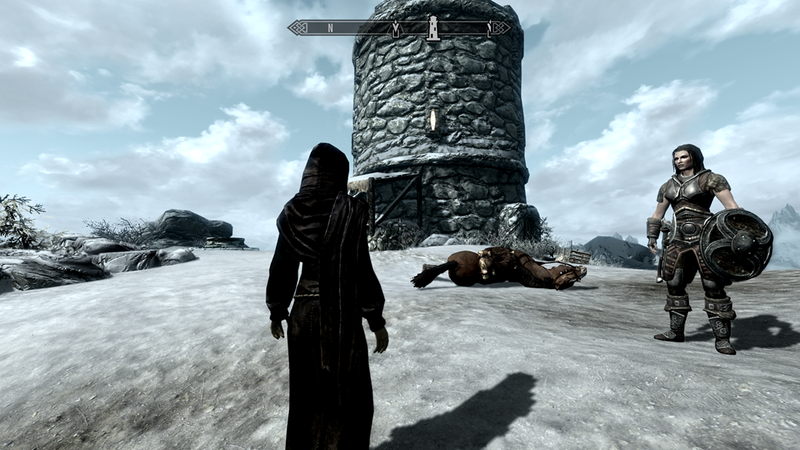 Before leaving Dawnstar, I stopped into the alchemist shop, “The Mortar and Pestle”. The proprietor of the shop, Frida, said she lost a ring. I said if I happened to find it, I would return it to her. I asked if I could borrow her alchemy table. I made a couple of potions to sell, health potions for Lydia, and magic potions for myself. 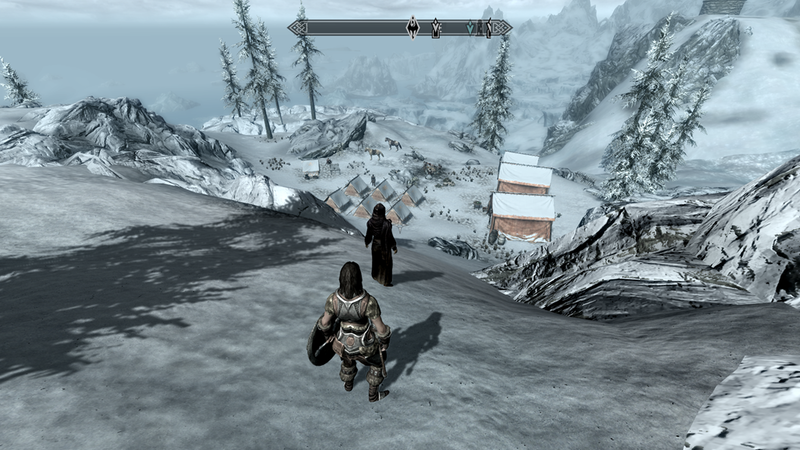 With our supplies replenished, we headed out of Dawnstar. The morning started off snowing, but cleared just as we arrived near an Imperial camp. Given the last time I encountered an Imperial camp, I was hesitant to approach. I didn’t care to be taken prisoner again. However, they had a warm fire, and it was lunch time. We strode in boldly. To my relief, the Imperials ignored us for the most part. We listened as Imperials shared stories on why they joined the Legion. Many were Nords who joined against their family’s wishes because they believed in holding the Empire together. As we ate our lunch, it occurred to me I never asked Lydia where her loyalties lie. Was she for the Empire, or the Stormcloaks? I was still new to Skyrim, and tried to avoid entanglement in the politics. Given my tenuous background in a foreign land, I remained neutral. I already got the subtle feeling most assumed I sided with the Thalmor merely because of my high elf ethnicity. If they knew the truth of my heritage, it would be difficult to shake the stereotypes and assumptions. I decided I would ask her another time. If she supported the Stormcloaks, then we would be in unfriendly company. Pantea’s flute was in a place called Hob’s Fall Cave. On the way there, we approached a lighthouse. As we got closer, we could see something was wrong. Pushing the door open, we were overwhelmed with the smell of death. Fortunately, the northern chill had blunted most of the decay, but the scene still made my stomach lurch. It did not seem survivors were likely. 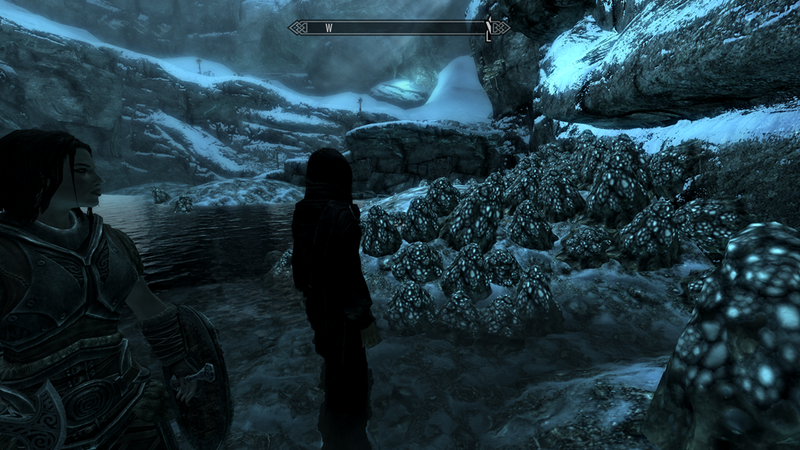 “Lydia, I think I found your ‘scissors’,” I said, staring at the hideous beast. It was a giant bug with massive pinchers. “What is a chaurus? I’m not familiar with this beast,” I said. I was still learning Skyrim’s bestiary. “It’s an underground dweller. I’ve never seen one myself.” She poked at it with her sword. An egg dropped out. I picked it up and inspected it. I gingerly took a bite. I rolled it on my tongue. Bitter, and it was making my mouth go numb. Utterly awful. It was poisonous, so I spit it out. “Well, you may get your chance. It looks like they came from the cellar,” she said, pointing to the blood trails. I found a number of journals scattered around indicating there was a whole family who lived here. They moved from Hammerfell after purchasing this lighthouse. However, they heard strange, scratching noises coming from the cellar. They thought it was rats. Worse than rats, I thought. Giant, human eating cockroaches. We went into the cellar and found there was a breech in the wall. Something had broken through. There was an underground ice cave. We were attacked by more of these chaurus’s, who spit a horrid poison. Their bite was far worse, though. I had to stay clear. I had visions of their incisors slicing me clean through. 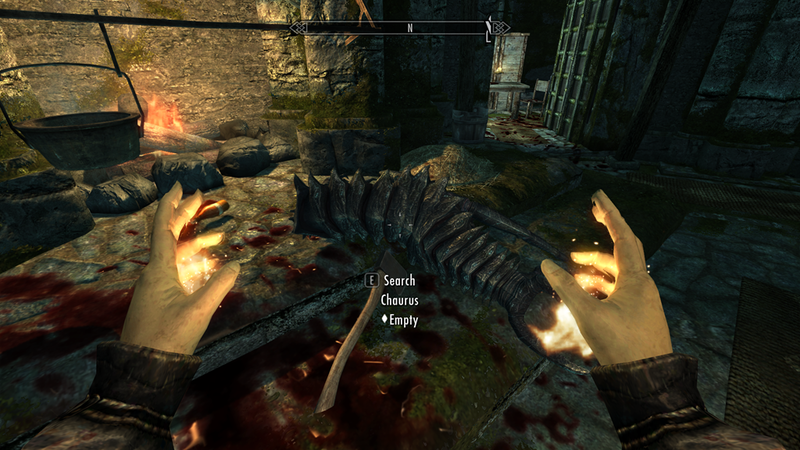 I let Lydia take the charge, and I assisted, taking care to avoid her. Not always an easy thing to do, but we managed. 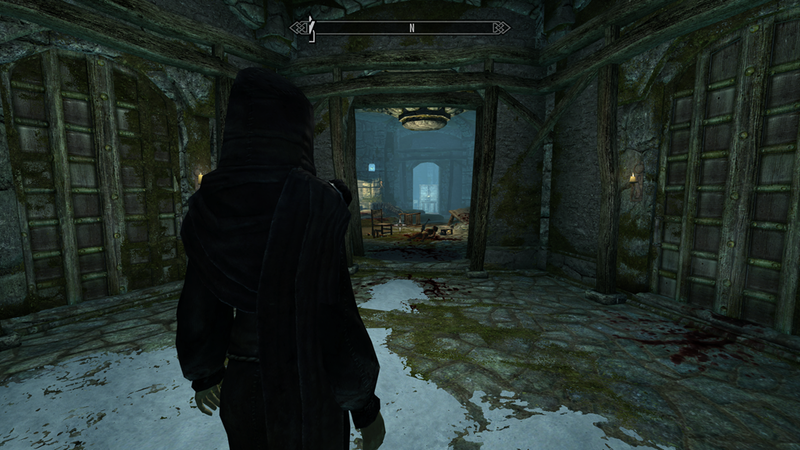 Further in, we discovered a camp with creatures Lydia called “Falmer”. She said they were supposed to be the twisted descendants of the long extinct snow elves. They were forced underground during a war with the ancient Nords, and became sightless. It seemed the Falmer kept chaurus as pets. Or maybe they were raised for food. It was hard to say. There was an enormous cave of eggs. I collected as many as I could carry. “And I thought eye of newt was bad,” Lydia said as I pulled eggs from their slimy encasings. “Eye of newt tastes better. Great in tea,” I teased in my best immitation of a hagraven. I cackled gleefully to emphasize the point. All joking stopped as we reached the main cavern. There was an enormous Chaurus surrounded by a number of smaller ones. To be honest, I felt we were in over our heads. Battling the little ones was challenging enough, but this big one was above our ability. In order to engage it, we had to jump down into a chasm with no retreat. 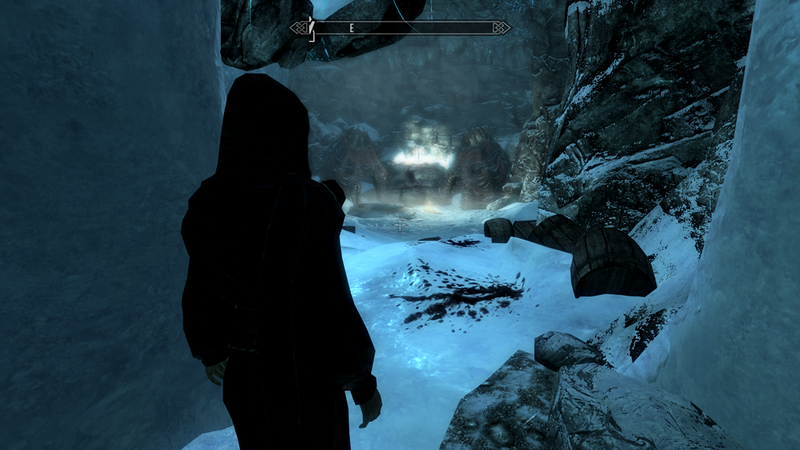 Given Lydia’s hesitance to jump while seeking King Olaf’s Verse, I was afraid of being down there on my own. There was no way I could tackle a giant chaurus and its spawn on my own. I tried sending a few flame atronachs down, but they didn’t last long. A couple of chomps from the big chaurus cut them in half. I gulped when I thought what it would do to me. I was not jumping down there. I slung firebolts at them, and ducked their poisonous spit. I was wittling them down, but it was going slow. I dug through my pack, desperate to find something that would help. Potions, spells, scrolls – seemed I carried a bunch of junk, but nothing that would help. Wait, I had a scroll of Mayhem. I already tried the spell Frenzy, but they resisted. My power was not strong enough to control them. But Mayhem looked promising. The description said it was a more powerful version. I directed the scroll’s power at the little chaurus. The large chaurus reaper resisted, but it had the desired effect on the little ones. The reaper cut them both down when they turned on each other. Perfect. Now only the reaper remained. I had no choice but to continue summoning flame atronachs and fling firebolts at it. Then finally, it fell dead. Hardly a battle worthy of epic lyrics, but it was done. I searched the reaper and was disgusted to find the digested remains of Habd, the lighthouse owner. I was loathe to touch it, but I thought he deserved a decent burial with his wife and children. Inside the chasm was a massive egg nest. I shivered to think what would happen if all those eggs hatched. I collected as many as I could find. In the end, I collected well over 300 eggs. Lydia and I exited without further incident. I sent her outside to set up a funeral pyre. I checked his wife’s journal so we could name them properly in the funeral rites. I discovered a passage that said he would have wanted his ashes scattered in the lighthouse fire. So I climbed up the lighthouse steps, put his remains in the lantern and lit it. I felt a magical shift. A blessing was bestowed on me called “Sailor’s Repose”. It made my healing spells 10% more effective. There was also a locked chest. I found the key along with Habd’s remains. I took the items inside. I uttered a silent prayer to Habd and his family that I would see to it their belongings would go to good use. It was now nearing evening. We would not make the journey to Hob’s Fall Cave. We decided to return to the Imperial camp. The commander said we were welcome to share the fire for the evening. It was mostly cloudy, but behind the clouds I could see the aurora borealis. I was speechless. This was the first time I had seen them. I read about them in my studies of Skyrim before I came, but I could never have truly appreciated how magical they are. I stared at them, shivering in the cold for as long as I could stand. I reluctantly settled into the tent the Imperials offered us as the auroras disappeared behind more clouds, and it began to snow. I lay down, but did not fall asleep right away. The idea of falling asleep was almost like flinching to avoid touching a hot kettle. But then, I recalled a memory. It was Anariel who comforted me after having nightmares as a child. I escaped Vaermina’s wrath in my last nightmare by seeking refuge with Akatosh’s avatar. Yes, I can control my dreams. Very well then, Vaermina. Let’s do this.